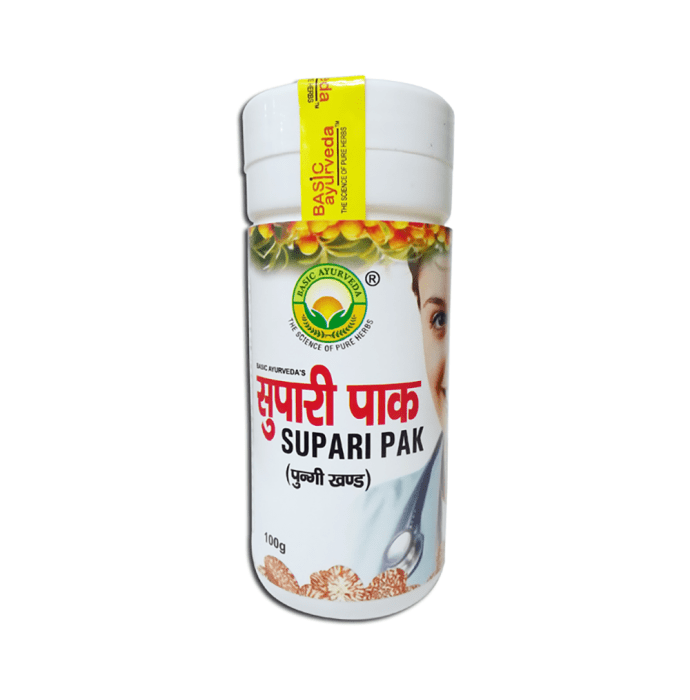 Basic Ayurveda Supari Pak contains kapoor(camphora), dalchini(cinnamomum zeylanicum) , tejpat(cinnamomum tamala), nagarmotha(cyperus scariosus), sookha pudina, pipal (piper longum), khurasani ajwain, chhoti elaichi(elettaria cardamomum), talish patra (taxus baccata), vanslochan (bambusa arundinacia), javitri(myristica fragrans), swet chandan(santalum album), kali mirch(piper nigrum), jaiphal(myristica fragrans) and safed jeera(cuminum cyminum). It has been used as an effective remedy of the diseases of women. It is a unique medicine for the treatment of leucorrhoea. It is a revitalizing tonic for the female reproductive system. It is an ayurvedic herbal medicine for curing leucorrhoea. It is very useful in woman's physical weakness, facial paleness and anemia. It remedies back-ache and pain in shins. It balances production of female hormones. It assists women to restore health after delivery by relieving weakness, headache, backache and other problems like pain in the lumbar region and a dragging sensation in the abdomen. Take 10gm to 20gm every morning with milk or as directed by the physician.